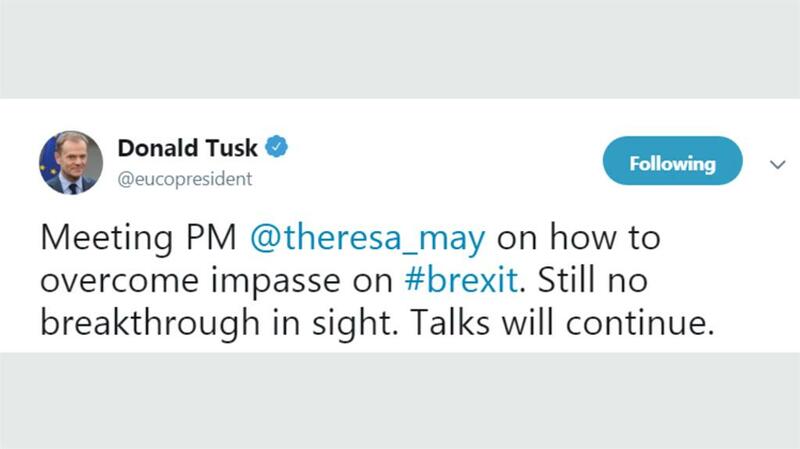 DONALD TUSK has been accused of taking a leaf out of Donald Trump’s book to troll Theresa May over Brexit. The outspoken EU Council leader followed up his ‘special place in hell’ comment with a tweet yesterday rejecting the prime minister’s claim of progress after the pair clashed in Brussels. Mr Tusk caused outrage on Wednesday when he claimed there was a ‘special place in hell’ for those who promoted Brexit without a plan. 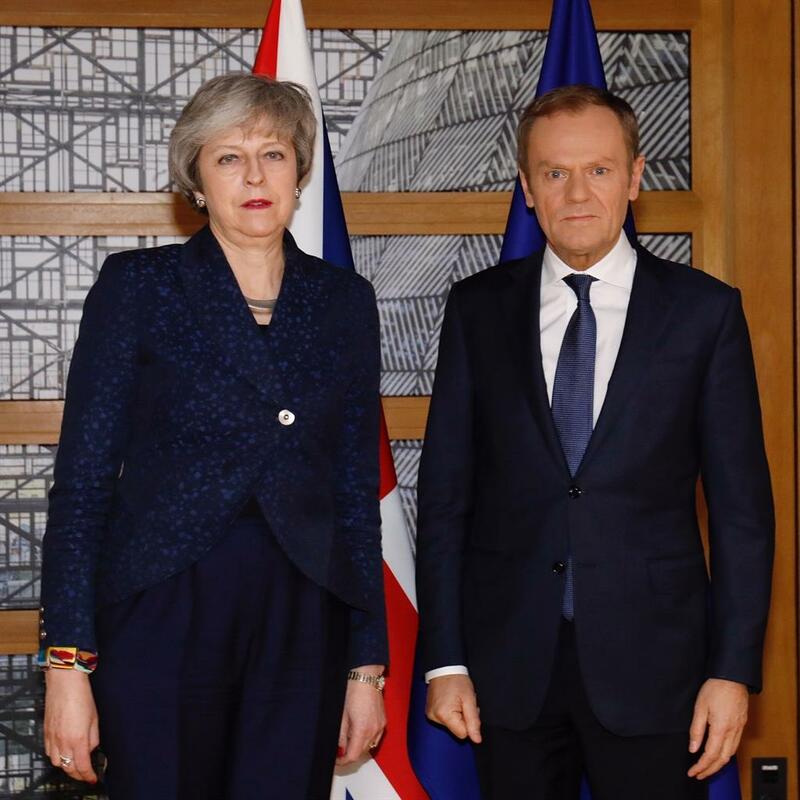 Mrs May said: ‘I’ve raised with president Tusk the language that he used, which was not helpful and caused widespread dismay in the UK. Mrs May said she and EU Commission president Jean-Claude Juncker had ‘agreed talks will now start to find a way through this’ but these were likely to last until the end of the month, four weeks before the UK’s exit date. Mr Juncker again insisted the withdrawal agreement would not be renegotiated, despite it being overwhelmingly rejected by MPs last month. EU negotiator Guy Verhofstadt also claimed Mrs May admitted the backstop would have to stay — despite MPs voting for its replacement. He urged her to co-operate with Labour after party leader Jeremy Corbyn wrote to her with an offer to back a Brexit deal that included a permanent customs union. Health minister Stephen Hammond and up to five other cabinet colleagues could resign if the government heads towards a no-deal Brexit. Mrs May is now expected to put her deal to the Commons towards the end of the month, although MPs will still vote on amendments next Thursday, including a motion reintroduced by Labour’s Yvette Cooper ruling out a no-deal. MOBILE roaming charges — coupled with visa costs and a drop in the pound — mean people travelling to Europe face a ‘triple whammy tourist tax’ after Brexit, shadow culture secretary Tom Watson warned yesterday. He said ministers had ‘caved’ to the ‘lobbying might of telecoms companies’ after it emerged a no-deal Brexit could see roaming charges in Europe be brought back. It came after culture secretary Jeremy Wright had said ‘the availability and pricing of mobile roaming in the EU would be a commercial question for the mobile operators’. Mr Wright told MPs it would not be possible for the government to enforce UK rules and expectations upon EU mobile operators, and urged Labour to back a Brexit deal. In the Lords, former Labour minister Lord Rooker warned those using credit cards in Europe would be ‘ripped off’ due to ‘a conscious decision of the Treasury to allow extra charges’. Digital, culture, media and sport minister Lord Ashton said the government was trying to ‘retain the benefits that we can’ in UK law.